Every year, Church Mutual camp and conference center customers report more than 300 injuries to their employees. One occupation needing specific risk management attention is maintenance staff. Never use a ladder for any purpose other than the one for which it was designed. Keep ladders free of oil, water, grease, wet paint and other slipping hazards. Ensure that the feet of the ladder are always on a dry, even surface. Keep the area around the top and the bottom of the ladder clear of obstructions. Provide safety training about proper body mechanics and lifting techniques. Limit activities that require frequent bending or awkward body positions. Institute a team-lifting policy when carrying tables or handling large, heavy or bulky items. Plan the day’s workload. Perform heavier tasks at the beginning of the work shift before fatigue starts. Establish procedures for inspecting and maintaining equipment. Maintain clutter-free workshop areas. Always return tools to proper storage locations after use. Secure tools and materials to prevent them from falling. Mark or pad obstructions that cannot be removed to help reduce the possibility of direct contact or injury if contact occurs. Instruct employees to check for nails, splinters, rough strapping and sharp edges before trying to lift a load. Require employees to wear gloves, where appropriate, such as when mowing or cutting brush. Require employees to wear safety goggles and a face shield when grinding or using cutting tools. Train employees on the proper use of specialty equipment, such as a chain saw or wood splitter. 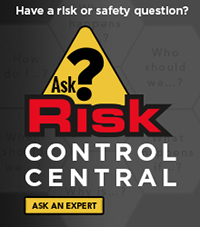 For a complete collection of the Risk Alert for Camps & Conference Centers series, click here.